I made this Sorrowmoss farming guide to help out players who want to farm the herbs instead of buying them from the Auction House. It's recommended to have around Herbalism 285, so you won't get herb fragments. Sorrowmoss can only be found in Swamp of Sorrows, you can't farm it anywhere else. Fortunately, the zone is filled with Sorrowmoss. 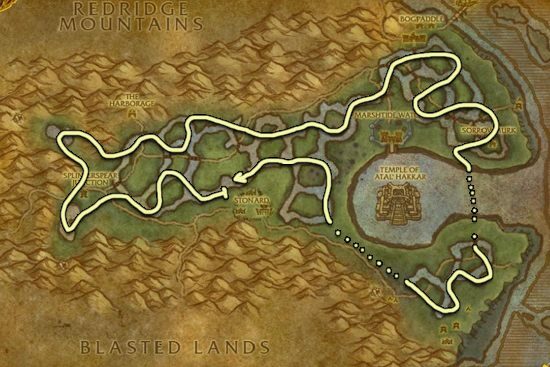 The herbs in the zones are really spread apart, so the farming route usually goes in a zig zag. You can also get a lot of Golden Sansam in this zone if you need it for something. But even if you don't need them, it's a good idea to pick them up so you can sell them.